There are few things I hate more than having to throw away food. We used to shop for groceries once a week and then we wouldn’t get through all of the fresh produce and so much would go to waste. To avoid this, I’ve started making more frequent trips to the supermarket and/or farmers market for fresh produce. Despite my best efforts, some weeks get really busy and I inevitably end up with fruits and/or vegetables that are desperate to be used. 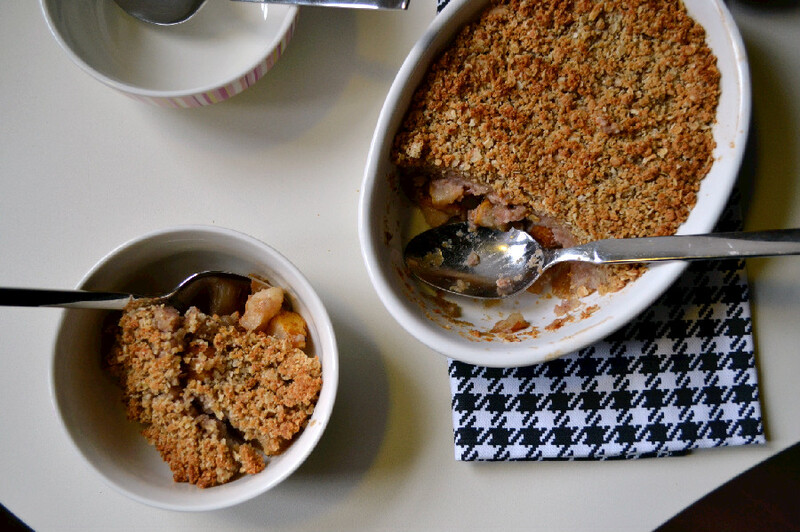 This crumble was born out of the need to use up some pears in the refrigerator and to prepare the next mornings breakfast in advance. The primary spice used here is Cardamom. Having used it with other spices in the Baked Pumpkin Oatmeal and Spiced Pear Amaranth Porridge recipes I recently posted, I wanted to give it a chance to shine in this recipe. Its so seasonally appropriate, it’s warming, it’s aromatic, it’s vibrant and fills the air with a wonderful scent that is sure to wake up your senses early in the morning. A perfect and nutritious breakfast or brunch option any day of the week and over the holidays, to give your body a break from all the sugary treats. This recipe feeds two or three people, but can be easily doubled or trippled to feed a crowd. 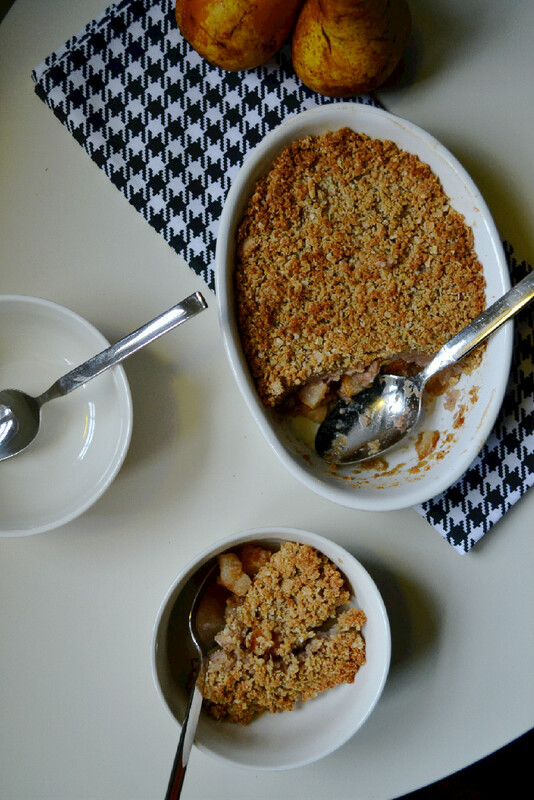 Add filling ingredients to a small pot over medium heat and cook for about 5-7 minutes, until pears are softened. Pour filling ingredients into a small oven safe dish. 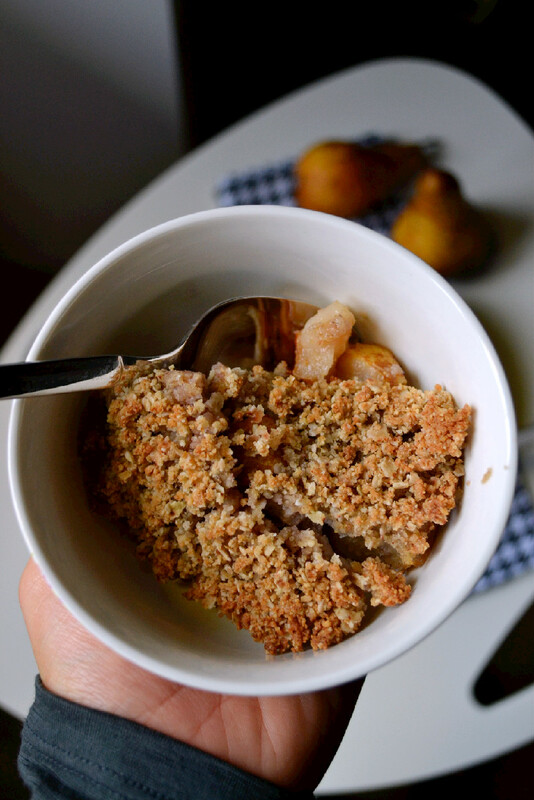 Combine topping ingredients in a mixing bowl and mix well to combine, until you have a crumbly, slightly sticky mixture. Pour topping mixture over the filling and flatten out. Bake in a preheated oven at 180 C for about 25-35 minutes, or until the top has turned a golden brown colour. Adjust bake time to your oven if necessary. Serve for breakfast or as a snack, with or without ice cream. Store leftovers, covered, in the refrigerator. Remove from refrigerator at least 10 minutes before serving and reheat in the oven for about 10 minutes.